The US House of Representatives has voted to revoke President Donald Trump's emergency declaration over building a US-Mexico border wall. The bid to overturn the declaration now goes to the Republican-majority Senate, where some conservatives have said they will vote with Democrats. Mr Trump, who declared the emergency after Congress refused funding for the wall, has said he will veto the bill. The resolution passed the Democrat-led House by a margin of 245-182. Thirteen Republicans sided with Democrats in rejecting Mr Trump's national emergency, which suggests Congress would not have the two-thirds majority of both chambers needed to override a veto from the president. Lawmakers are using a provision from the National Emergencies Act to overrule the president, but it requires both chambers to vote for it and to complete voting within 18 days. The president has called the situation at the southern border a "crisis" and on 15 February, issued a declaration of emergency in order to bypass Congress and build a wall with military funding. Democrats say the declaration is unconstitutional and that Mr Trump has manufactured the border emergency. 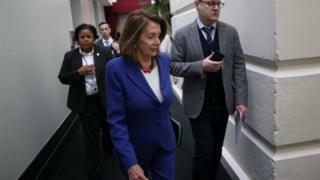 Speaker of the House Nancy Pelosi said on Monday: "This isn't about the border. This is about the constitution of the United States. This is not about politics. It's not about partisanship. It's about patriotism." What a difference a few years - and a new presidential administration - make. In 2014, when Barack Obama used his executive authority to defer deportation of certain classes of undocumented migrants, Democrats defended him, while Republicans howled about an abuse of presidential authority. Now it is Republicans attempting to explain President Donald Trump's use of an emergency declaration to redirect funds toward his border wall, while Democrats issue dire warnings of White House overreach. Such is the ease with which the playing field flips in American politics. The Democrats in control of the House of Representatives, joined by a handful of Republicans, have rebuked Mr Trump for this wall declaration. That sets up a showdown in the Senate, where some conservatives - particularly those up for re-election in 2020 battleground states - are uneasy about going along with what they see as a dangerous precedent. They could hand their president an embarrassing setback, forcing him to use his first veto of his administration. Then - because a congressional veto override seems unlikely - the legal battle will shift to the courts. The battle for public opinion will stay firmly in the realm of the politicians, of course. While many Republicans were critical of using an emergency declaration for a wall prior to Mr Trump's decree, some are now arguing the president is using the authority given to him by the constitution. House Minority Leader Kevin McCarthy of California said Republicans would uphold Mr Trump's decision and accused Democrats of ignoring the emergency at the border. Ohio Representative Warren Davidson said: "I think he didn't necessarily have to do the emergency declaration, but he did, and it's legal," the Washington Post reported. But others maintained Mr Trump's response to a lack of congressional funding was inappropriate. In the Senate, more Republicans have expressed concerns about setting a dangerous precedent, and Vice-President Mike Pence met members during a closed-door lunch on Tuesday to discuss the issue. Majority Leader Mitch McConnell has maintained the emergency declaration is "the predictable and understandable consequences of Democrats' decision to put partisan obstruction ahead of the national interest". Mr Trump's emergency declaration would open up almost $8bn (£6bn) for the wall, which is still considerably short of the estimated $23bn cost of the barrier along almost 2,000 miles (3,200km) of border, but far more than the $1.375bn allotted by Congress for barriers.